I must start by apologising for the paucity of posts lately. I've no really good excuse, but I've been struggling to find the time to cook anything new. Anyway, there are some dishes that I just never get around to adding to this blog, despite making them frequently. In this case I think it’s because I hardly think of it as a recipe at all – just some things thrown together. But this is my ultimate comfort food and whenever I feel like an unexpected item in the bagging area of life, then this is the dish I reach for - even if it is slightly odd. According to my notebook I first made this a little over 2½ years ago, which was not long after I read the first Ottolenghi cookbook. It’s not an Ottolenghi dish – he wouldn’t sink so low – but it owes a lot to the combinations of flavours in that book. It’s not a pretty dish either, but it is very tasty and flexible. This recipe will serve to comfort 2 hungry people. Preheat the oven to 180°C. Toss the squash in a little olive oil, salt and pepper and roast for 25-30 minutes until it’s soft and taking on a little colour but not falling apart completely. While the squash is roasting, cook the sausages. Since the oven’s on, I usually roast the sausages alongside the squash – they’ll probably need 20-25 minutes depending upon thickness. Spread the pistachios out on a dry baking tray and lightly toast in the same oven for about 5 minutes. Meanwhile make the dressing by simply combining all the ingredients in a jar and shaking vigorously for a little while. When the squash is cooked, put it into a reasonably large bowl. Cut the cooked sausages into smallish chunks and add to the squash. Stir in the pistachios, sultanas and peppers. Pour over the dressing and stir it gently in. Leave to one side while you prepare the couscous. Place the couscous in a lidded, ovenproof dish which is big enough to hold all the ingredients. Bring the stock to boiling point and pour it over the couscous, give it a stir, cover and leave it alone for 5 minutes. Use a fork to fluff up the couscous a little and stir in the squash and sausage mix. Check the seasoning and add more if needed. Heat the oven to 160°C and put the dish in the oven to warm through for about 15 – 20 minutes – longer if you want it really hot, but oddly I prefer it warm. A dollop of chilli jam on top of each serving finishes the dish off nicely, possibly with a quick drizzle of balsamic glaze for luck. If you don’t happen to have chilli jam lying around, then a fruity and smooth mango chutney with some sweet chilli sauce stirred into it also works really well for me. 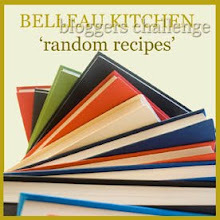 For this month’s Random Recipe challenge Dom of Belleau Kitchen has asked us to select something from our first ever cookbook. This is a big problem. I genuinely admire people who remember everything so well that they can tell you their life stories in great detail and in the right order. That doesn’t really work for me. The further back in time, the less clear and distinctly odder it seems to become. Even more, I admire people who have managed to hold on to possessions such as cookbooks through all the changes in their lives. So I’m reduced to thinking what’s the earliest book that I cooked from all those years ago and that, by some strange stroke of luck, I still have around? And lurking at the back of a dusty pile of old books was dear old Robert Carrier. The book in question is “Cooking with Robert Carrier” which was published in the early eighties but is a greatest hits selection of recipes from the sixties and seventies. Mr Carrier OBE, who is sadly no longer with us, was about as close as you could get to a celebrity chef back then and a welcome alternative to many of the styles of cooking on offer. The random recipe selected from this book is Pear Clafouti, which is fairly classic and lacks some of the flamboyance and, luckily for my health, the large amount of cream of some of his other recipes. The good news is that the recipes still work and still taste very good. Mr Carrier suggests that this will serve 4, but I think 6 is more like it. I have adapted this recipe a little but I think he’d forgive me. Sift the flour and salt into a bowl, make a well and pour in the eggs. Stir thoroughly while gradually adding the milk, then beat well. Peel, core and slice the pears and mix them with the sugar, lemon juice and cinnamon (or vanilla – I’m not that keen on cinnamon and, for some reason, especially not with pears). Grease a 20 cm baking dish or cake tin. Stir ¾ of the pears into the batter and pour into the tin. Arrange the remaining pear slices over the top and brush any exposed bits of pear with a little melted butter. Bake at 180°C for 40 – 55 minutes until it’s brown (but nor burnt) on the top and set (but not too firm) in the middle. Mr Carrier suggests that 40 minutes will be enough but this will depend on just how juicy your pears might be – the more liquid, the longer the cooking. I think this is best served at room temperature, sprinkled with icing sugar and maybe with a little crème fraîche on the side. First of all I feel I should apologise to the people of Nantes (perhaps I should apologise to all the people of Brittany and even the entire population of France, just to be on the safe side). The reason being that Gateau Nantais is a traditional recipe which I have to admit that I've tweaked a bit. The traditional and authentic version tends to be quite heavily flavoured with rum – there's more rum in both the mixture and the syrup and an icing made purely with rum and no water. So, a lot of rum, then. My version is more lightly flavoured with rum, which means that the almond taste is more prominent. Anyway, this is the version I like, either as a dessert or with a cup of tea. Preheat the oven to 170°C. Butter and line a 22 cm cake tin – do this fairly thoroughly because the gateau does like to stick. A springform tin is probably ideal, since the gateau is best removed from the tin while still warm. Mixing the cake is made easier by using the paddle attachment on an electric mixer but it's certainly not essential. Cream the butter and sugar together thoroughly. Briefly beat in the ground almonds. Beat in the eggs a little at a time (in at least 3 parts). Finally, sieve the flour over the mixture and gently fold it in together with the rum and the almond extract. Put the mixture into the prepared tin and spread it out as evenly as possible. Bake in the preheated oven for 40 – 45 minutes. The gateau should look a light golden colour, so if it seems to be browning too quickly after 25 minutes or so (and in my experience there's a good chance that it will) then cover the tin loosely with some foil. While the gateau's baking, make the syrup. Add the sugar and water to a small saucepan and heat, stirring all the time, until the sugar dissolves. Bring to the boil and boil for 30 seconds or so. Take off the heat and stir in the rum. Once the gateau is evenly golden and no longer squidgy, take it out of the oven and, as soon as you dare, remove it from the tin and place on a cooling rack. Paint the rum syrup evenly over the top of the gateau while the syrup is still warm and the gateau is still hot from the oven. Leave to cool completely. Once the gateau is cold, mix the rum into the icing sugar and add as much water as needed to make a smooth icing which is not too runny (around 2½ tsp should be about right). Spread the icing evenly over the gateau and don't worry too much if a bit dribbles down the edge.